The alternative alignment that routes the Cross Island Line (CRL) around the Central Catchment Nature Reserve (CCNR) could add about $2 billion to the rail project, the Land Transport Authority (LTA) has revealed. 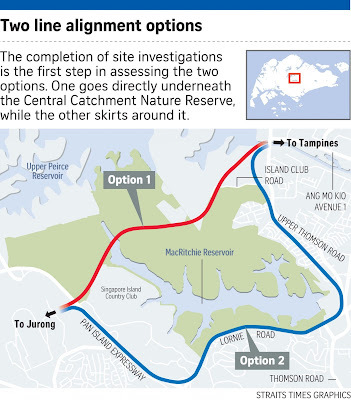 This 9km-long "skirting alignment" will require longer tunnels and extra ventilation facilities, it said, compared with the 4km direct route, of which 2km will cut through Singapore's largest nature reserve. "Besides land and home acquisitions that could affect families, the extra works could incur $2 billion more in expenditure," said LTA chief executive Chew Men Leong. In a letter to The Straits Times Forum page, signed by Mr Chew and published today, the LTA reiterated that the Government was studying both alignment options and had not made a decision. Since a report on the environmental impact of site investigation works for the project was released recently, green groups have been lobbying hard for the CRL - a 50km MRT line that will span Jurong to Changi - to be built around the reserve, instead of through it. However, this could entail land acquisition, as the MRT tunnels would pass through homes, businesses and buildings. Residents in Upper Thomson who could potentially be affected have called for the line to go through the reserve. Mr Chew said the Government will consider all factors, including the engineering feasibility of both alignments, distance and travel time for commuters, cost to tax payers, and the impact on the CCNR and on businesses and families. Details on the CRL, such as the number of stations and the construction cost, have not been announced. Green groups conceded that the extra $2 billion and the impact on residents are significant, but called for deeper thought on the issue. Dr Shawn Lum, president of the Nature Society, asked: "What is the long-term cost to Singapore of potentially damaging (the) nature reserve? Are we setting the precedent that, as long as we pledge to be careful, we can do infrastructure works in protected areas?" Mr Subaraj Rajathurai, director of Strix Wildlife Consultancy, said: "This island used to be covered in rainforests; today we are down to 3 per cent. It has taken eons to evolve and the biodiversity is irreplaceable. Homes, however, can be cleared and rebuilt." Mr Sangameswaran, 69, president of the Yew Lian Park Residents' Association, which has called for the CRL to go through the reserve instead of their 216-home private estate, said: "I think the public will be up in arms about the $2 billion. They will want the justification." $2 billion. 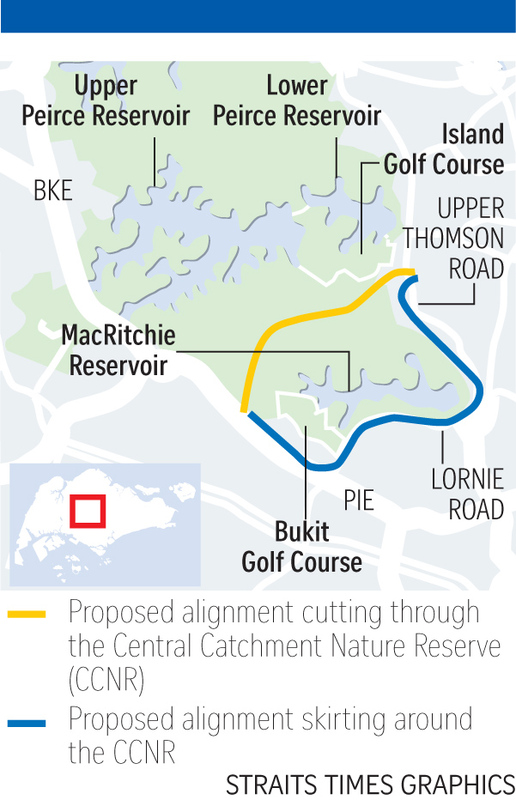 That's how much an alternative alignment where the Cross Island Line skirts the Central Catchment Nature Reserve could cost. The LTA said the proposed tunnel beneath the CCNR will be about 40m deep and no surface structures will be built. A second phase of the Environment Impact Assessment, to be completed this year, will study the environmental impact of the construction of both alignments. Transport consultant Bruno Wildermuth, who was involved in the building of Singapore's first MRT line, said the $2 billion must be viewed in the context of the financial viability of the entire CRL and how many people it will serve. Dr Park Byung Joon, adjunct associate professor at SIM University, said skirting around the nature reserve involves "social costs", including increasing end-to-end travel time to around four minutes more. He said an extra $2 billion for 5km more of train tunnelling was "a bit expensive" and showed that there may be construction challenges. "The alignment is substantially curved and the costs to maintain the line may go up," he said. We thank all writers who have shared their views on the two possible alignments of the Cross Island MRT Line (CRL). The Government is studying both underground alignments, and no decision has been taken yet. 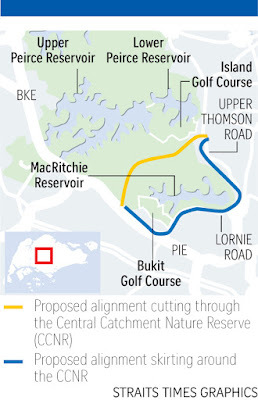 For the 4km direct alignment, 2km of the tunnel will be below the Central Catchment Nature Reserve (CCNR), while the other 2km is located outside it. The section of the tunnel beneath the CCNR will be about 40m deep, depending on findings from ground investigations. There will not be any construction of infrastructure on the surface. The skirting alignment, about 9km long, will require longer tunnels and extra ventilation facilities. Besides land and home acquisitions, that could affect families, the extra works could incur $2 billion more in expenditure. The two alignments may have different impacts on various stakeholders - the nature reserve, businesses, home owners, commuters and taxpayers. The Government has a responsibility to study both thoroughly before making a decision. Ground investigations and engineering feasibility studies of both alignments have to be completed first. For the upcoming ground investigations, following our extensive consultations with nature groups for the first phase of the Environmental Impact Assessment (EIA), we are reducing the number of 10cm boreholes from 72 to 16, and confining them to public trails and existing clearings. The Land Transport Authority (LTA) will complement these with non-intrusive geophysical survey methods and horizontal directional coring that will start from outside the CCNR. Thus, no vegetation will be cleared. National Parks Board staff will accompany the contractors and consultants during all off-trail works to ensure that the greatest care is taken to protect the CCNR. In making the decision on the alignment, the Government will have to consider the full range of factors, including the engineering feasibility of both alignments, distance and travel time for commuters, cost to taxpayers, and the impact on the CCNR and on businesses and families who may be affected by land acquisition under the skirting option. Indeed, since the gazette of the EIA, home owners have asked to meet the LTA, and voiced their concerns over possible acquisition of their homes. They urge the Government to be objective, and to also take into account their concerns. In response to requests from the public, the findings of Phase 1 of the EIA have been made available on the LTA website. We thank the public for sharing their views, and we will take into account the diverse concerns of different stakeholders. Exchanges over the impact of possible MRT tunnel construction under a nature reserve echo the tensions evident during the Senoko nature debate in 1994 and the Chek Jawa controversy in 2001. Both were similarly characterised as a contest between the intrinsic value of the nation's precious little natural heritage and the intrinsic value of beneficial development in a land-scarce city. To see the Central Catchment Nature Reserve debate in the same light would not be entirely wrong but the larger issue is the handling of tensions when multiple competing interests surface over a major decision yet to be made. Significantly, it was the green question that served as a catalyst for such wider self-examination by the State. The Senoko case saw a technocratic response to a ground effort to save a nesting ground for 200 bird species - space planners wanted for 17,000 new homes. That was apparently resolved by weighing the pluses and minuses objectively. A different result was possible only if activists could persuade 17,000 housing upgraders to opt out of the waiting list for the sake of the birds. Chek Jawa, less than 10 years later, saw a policy reversal after the facts were deeply contested between a public agency and environmentalists. Tipping the balance were ground surveys by volunteers that saved the biodiversity from being trampled, had it been used for military purposes instead. Having gone a further 15 years down the road, one might ask if the approach of the authorities has changed materially. Housing, defence and transport are all large imperatives that might dictate an instrumental ordering of competing interests by planners. Yet, after Chek Jawa, even civil service leaders have acknowledged that "Singaporeans want a bigger say in policies… (and) the public sector will have to adapt to these changing circumstances", as a public agency chief had noted. However, in the latest case, the Land Transport Authority left some wondering about its willingness to engage the public, by originally making a crucial environment assessment report available only by appointment at its office, till March 4. Clearly, the issues raised as a whole go beyond the technical. But by the same token, those against any work under the forest have not given enough weight to the depth of the tunnelling to be done - about 40m underground depending on further analysis. Nature aside, there is a call for homes and businesses to be preserved by avoiding an alternative alignment of the MRT Line that would go around rather than under the nature reserve. There are also issues of longer travelling times and incremental building costs of $2 billion. The green legacy matters, of course, but the latest debate should also help to clarify broad terms of preservation amid necessary change that are supported by Singaporeans. The additional $2 billion that will be incurred by building the proposed Cross Island Line around the Central Catchment Nature Reserve instead of across it is likely to be a fraction of the total cost of the MRT project. The Land Transport Authority (LTA), which had given the $2 billion figure in response to proposals for the line to skirt around the nature reserve, said yesterday it is unable to estimate the total cost of the 50km Cross Island Line as studies on the entire line have not been completed. But industry experts estimate that the cost of the project could be as much as $40.7 billion. This is based in part on calculations for past and ongoing MRT projects, which show that each kilometre of MRT tunnel costs about $350 million to $400 million to design and build. Costs could go up by 25 per cent if eight-car trains are used, compared with the three- or six-car trains used currently. The introduction of an express service, among other things, could also increase costs by up to 40 per cent owing to the need to build an additional track. 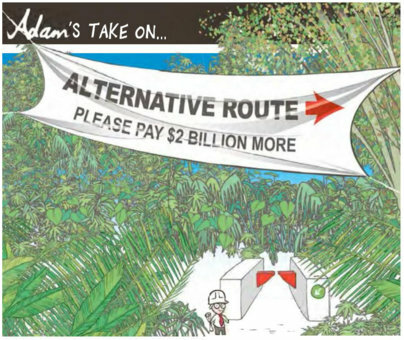 So the extra $2 billion for building the Cross Island Line around the nature reserve could work out to less than 5 per cent of the total cost of the project. Nature groups had earlier raised concerns that construction work on the Cross Island Line, expected to stretch from Changi to Jurong, would have a negative impact on the Central Catchment Nature Reserve, Singapore's largest nature reserve. This is especially so if the line cuts across the nature reserve instead of skirting around it. 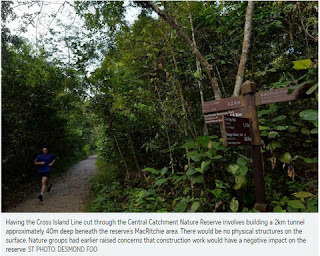 Having the Cross Island Line cut through the nature reserve involves building a 2km tunnel approximately 40m deep beneath the nature reserve's MacRitchie area. There would be no physical structures on the surface level. Some members of the public The Straits Times spoke to felt that the additional cost was justified if it helped ease Singapore's transport crunch. Those who have proposed routing the Cross Island Line round the reserve said the line would serve residents in the area and avoid disrupting the flora and fauna in the reserve. Dr Vilma D'Rozario, an associate professor at the National Institute of Education, said: "Routing around the reserve to pick up more commuters along the way would certainly help ease road traffic congestion and sardine-packed train conditions." Financial consultant Johnson Long, 70, believes that the additional cost can be recouped with increased ridership over the years. Residents who live in the estates that could be affected by the skirting alignment have voiced concerns that their homes would be acquired by the state for the building of the line. Mr Anthony Oei, 82, who has lived in Yew Lian Park for more than 50 years, questioned the need to divert the line. "Will we have to give way to wildlife?" he asked. Others said the possible environmental impact of the line going through the reserve should not be ignored. Commenting on some suggestions thrown up by the public, a spokesman for the LTA said it is not possible for the stretch of Cross Island Line in question to run under Upper Thomson Road, which is near the nature reserve, owing to limited space caused by construction work on the upcoming Thomson-East Coast Line. The Cross Island Line, announced in January 2013, is a 50km MRT line stretching from Pasir Ris in the north-east to Jurong in the west. According to the Urban Redevelopment Authority Master Plan 2014, the line will link a fast-growing residential district in the north-east to Singapore's largest industrial hub in the west. As it goes westwards, it will pass through Loyang, Punggol, Hougang and Ang Mo Kio before reaching Sin Ming. From there, it will go towards Bukit Timah, Clementi and West Coast before terminating at the Jurong Industrial Estate. Besides linking residents to jobs, the line will serve the upcoming "creative cluster and learning corridor" in Punggol, which will include the Singapore Institute of Technology's new campus. The line is also part of an overall strategy to build some redundancy into the rail network to mitigate the impact of disruptions. Government Parliamentary Committee for Transport deputy chairman Ang Hin Kee, who is also an Ang Mo Kio GRC MP, said: "People in Ang Mo Kio, for example, are served only by the North-South Line. If there are repairs or maintenance work on that line, they have no other rail option." The Cross Island Line is also likely to stop at the proposed terminus of the Kuala Lumpur-Singapore high-speed rail line in Jurong East. When completed in 2030, it will facilitate access to Singapore's seaport, which will move to Tuas by then. The line will provide relief to the already heavily used 57km East-West Line. The Punggol-Pasir Ris stretch of the Cross Island Line will also form the first leg of the North Shore Line - a yet-to-be announced MRT line that links Pasir Ris to Woodlands. According to the Land Transport Authority (LTA), residents in Punggol will be able to travel to Pasir Ris in 10 to 15 minutes, compared with a 40-minute bus ride today. The project will be unlike current MRT lines. For instance, trains are likely to have more carriages - eight cars each, or more. Current lines have three- to six-car trains. LTA declined to confirm this, saying only that the Cross Island Line is a "heavy-load" system. The Straits Times understands the line will be the first to have "scalable" platforms, which can be expanded. This will allow the operator to start off with say, six-car trains, and add more cars per train as ridership picks up. LTA is also considering express services for the line. This would cut end-to-end travel time, about an hour or so on the current lines. The debate over the impact of the Cross Island MRT Line on nature and on residents highlights the need to have moderate and diverse views, so that a balanced and informed decision can result. There are some arguments raised in the debate that we should all be mindful of. Mr Subaraj Rajathurai, director of Strix Wildlife Consultancy, was quoted as saying that "homes, however, can be cleared and rebuilt" ("$2b extra cost if MRT line skirts reserve"; Monday). Unless we are residents of affected areas, we should not make such judgments. Such an argument gives the impression that homes can be easily rebuilt, but the lives of those affected may be altered forever, and the life of those residents as they knew it may never be rebuilt. Stakeholders such as the Nature Society (Singapore) should also moderate their views. The society's Mr Tony O'Dempsey called for the construction of the MRT line to have zero impact on the Central Catchment Nature Reserve ("Call for 'zero impact' on nature reserve"; Feb 14). This is an extreme view because, living in land-scarce and densely populated Singapore, this is not realistic. Zero impact is something that is not enforceable in Singapore, so we should not make such a call any more. The fact that we spent $17 million on the Eco-Link@BKE - to restore the ecological connection between Bukit Timah Nature Reserve and the Central Catchment Nature Reserve, which were separated because of the construction of the Bukit Timah Expressway - and $1 billion on Gardens by the Bay shows that the Government wants to preserve our natural environment and allow future generations to enjoy various nature attractions. Strong lobbying by green groups has, to some extent, been too extreme, resulting in an unbalanced view presented to the public. Let's allow the Government to do its thorough assessment and make a balanced decision that prioritises serving the larger community. Whatever the outcome, I hope for a better and more efficient transport system. The building of the Cross Island MRT Line is the right decision and must go ahead. Speaking to current affairs programme Talking Point, parties call for a holistic cost-benefit analysis, not just focus on the S$2 billion extra cost involved in skirting the nature reserve. The Cross Island Line that will stretch from Jurong to Changi could save commuters up to 40 minutes of travel time, said Land Transport Authority (LTA) chief executive Chew Men Leong. The new MRT line, which is scheduled to be ready by 2030, has been the subject of controversy in recent weeks, over one possible option of running the line under the Central Catchment Nature Reserve. Some Singaporeans have even questioned the need for the line in the first place. Speaking to current affairs programme Talking Point, Mr Chew said the new line – with a potential daily ridership of 600,000 - would connect residents along the East-West corridor “to key employment centres such as Changi logistics park and the Jurong Lake district “with significantly shorter travelling times”. “I give you an example. If the line is done, commuters from Ang Mo Kio can reach any part of the island using public transport within less than one hour, basically saving easily 30 to 40 minutes of travel time,” he said. In addition, “half of the 30-over stations have connections to other lines. This creates many more travel options for commuters. And it will help redistribute load in the other lines, generally giving better comfort to all commuters. At the same time, during disruptions, you have alternative travel options, enhancing the resilience of the entire network,” said Mr Chew. A debate currently centres around two possible alignments in the middle section of the Cross Island Line. One is a 4km stretch that would run for 2km under the nature reserve, at a depth of 40m. The second option is to skirt the reserve in a 9km route that might require land acquisition, and add 6 minutes to travel time. “We have looked at many options. Right now, we have come down to two. There are not really other feasible alignments at this juncture,” said Mr Chew. It may take two years for a decision to be reached, Transport Minister Khaw Boon Wan has said. This is only after more environmental, technical and engineering studies as well as public consultations are carried out. "TALK COST BENEFIT, NOT CHEAPEST WAY"
Economist Euston Quah said what was currently missing was a systematic cost-benefit analysis of the two options. “We are not seeing a cost-benefit analysis being done. What we are hearing is how much additional cost it would take. This is cost effectiveness, not cost benefit; in other words, the cheapest way,” said Professor Quah, head of economics at the Nanyang Technological University. In terms of the more tangible benefits, for instance, going directly across the nature reserve would mean savings in travel time and the cost of land acquisition. Skirting it could mean the ability to pick up more passengers and spur more business activity in affected areas, noted Prof Quah. Transport analyst Lee Der Horng, of the National University of Singapore’s Department of Civil and Environmental Engineering, also noted that the longer alignment would see “more curvatures” that could mean “more wear and tear”, leading to higher costs of train maintenance in the future. But the intangibles – such as the loss to nature - are just as important in a cost-benefit study, said Prof Quah. A dollar value should be put to items such as flora, fauna, biodiversity and water contamination. “We have to know what is the magnitude and the probability of (such damage) happening; and then we can compute what would be the impact cost on society,” he said. How to assign a value? Find out how much people would be willing to pay to avoid crossing the central catchment area – such as through a survey about increasing the price of an MRT ride, suggested Prof Quah. It is not the final answer that is important, he said, but the process of making people think about what trade-off they will accept between economic development and environmental conservation. LTA’s Mr Chew reiterated that if it’s decided to take the direct route across the forest, there would be no structures, including ventilation shafts, on the surface. As for the construction, he emphasised: “We are only going to launch and recover the tunnel boring machine well outside the central nature reserve. We are not going to have a situation where trucks and vehicle movement are within the nature reserve - at all. We’re not going to do that”. Phase two of an environmental impact assessment (EIA) will be done later this year, on the likely impact of building and operating the MRT line either across or around the forest. But the final decision will take into account all possible impacts – on commuters, residents, businesses and taxpayers, said Mr Chew. For now, nature groups are concerned with the more immediate soil investigation works. An EIA report released in February showed a likely “moderate” impact of such works if mitigation measures are taken. These mitigation measures include reducing the number of boreholes to be drilled from 72 to 16, steps to contain waste water and noise, and protecting tree roots from movements of heavy machinery. No vegetation will be cleared, and NParks officers will supervise works to ensure no damage done, said the LTA. #Factually: Got questions on the Cross Island Line? The Ministry of Transport, Singapore is here with the answers. Tests to see how a train tunnel can be built under Singapore's protected nature reserve will start soon, but with 10 extra measures to reduce any negative impact on plants and animals. For instance, the National Parks Board (NParks) - custodian of Singapore's nature reserves - will be empowered to issue stop-work orders if pollution is detected. Nature groups will also get to observe the work as it is carried out in the Central Catchment Nature Reserve. These measures, revealed yesterday on the back of talks between the Government and nature groups, are on top of at least nine others announced earlier - such as using enclosures to reduce engine noise and tanks to collect discharge. Other measures include scheduling at least one rest day in between surveys, and engaging a tree expert to ensure trees are not damaged. These were spelt out in a tender that the Land Transport Authority (LTA) called yesterday to appoint a specialist to determine the soil profile under the reserve. The tests were initially expected to start in the third quarter, but will now take place in the fourth quarter after extensive talks between the LTA and nature groups. The groups are pushing for the 50km Cross Island Line to go around instead of through the reserve, where rare animals, such as the critically endangered Sunda pangolin, can be found. Nature groups told The Straits Times that they were heartened by the LTA's willingness to accept feedback. But they are still hoping it would reconsider an alternative alignment for the MRT line. "The Nature Society was hoping that soil investigation work in the forests could have been avoided as it involves people going into sensitive parts of the forests," said Nature Society (Singapore) president Shawn Lum. "But now that they are slated to go ahead, at least the impact will be reduced." The line, to be completed by 2030, links Changi to Jurong, passing through several housing estates. The findings of an environmental impact assessment (EIA) to examine the impact of soil investigation through the forest as well as around it was announced in February. Another phase of the EIA, which will be completed by year-end, will assess the impact of building and operating the MRT line for both routes. Other factors, including travel time and cost, will also be weighed when deciding which route gets the green light. SIM University economist Walter Theseira said the direct alignment will cut travel time. "While each commuter might save only a few minutes each trip, when added together, the time savings will be enormous," he explained. "The indirect alignment, however, could serve additional areas." Dr Theseira added that more needs to be done to "compare the economic benefits" of the two. "While I am quite sure such an analysis is being done internally by LTA, it would go a long way towards assuring the public that the right decision will be made if such an analysis is made public," he said. Associate Professor Donald Low, an associate dean at the Lee Kuan Yew School of Public Policy, said: "How a choice is framed can have a large effect on how people choose. If the shorter route... was presented as the status quo option, and the longer route was seen as the alternative that would cost $2 billion more and increase travel time by five to six minutes, people are more likely to prefer the shorter route. "But if the longer route was presented as the original option, and the more direct one as the alternative that would save $2 billion but pose some environmental risks, people are more likely to favour the longer route." • Using access routes mapped out by the National Parks Board (NParks). This restricts any damage to these areas. • Scheduling at least one rest day between surveys which require workers to go off-trail. Mammal researcher Marcus Chua says this could allow less-sensitive animals to continue using the area. • Nature groups will get to observe the work. • Engaging a tree expert to suggest ways to avoid damage to trees by the heavy machinery used to dig boreholes to test the soil. • Installing a silencer on the drill engine exhaust. • Conducting trial runs of borehole operations and off-trail surveys outside the reserve, so as to ensure equipment is fully functional and "within the stringent requirements of working within the reserve". • Allowing a longer period of time before resuming work after heavy rain so as to reduce soil erosion. • Accessing boreholes on Terentang Trail through the Bukit Kalang Service Reservoir compound, to cut vehicular movement. • Avoiding works in the rare freshwater streams, which are highly sensitive habitats. • NParks officers can order immediate stoppage of work if there are breaches of mitigating measures, or when there is pollution. 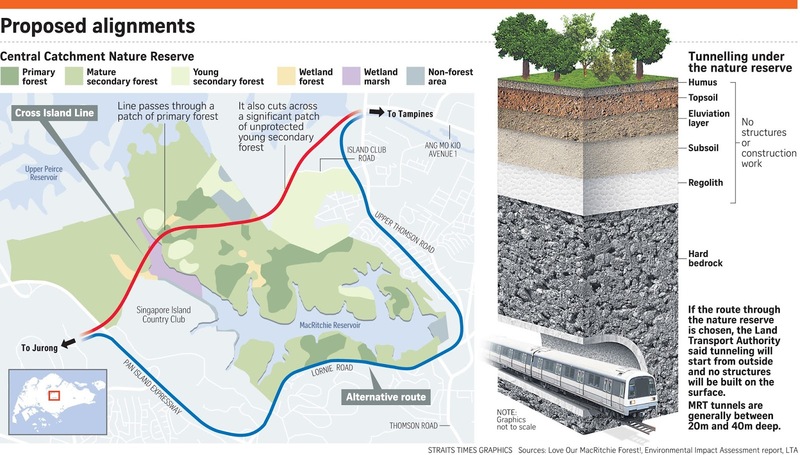 Works to see if the future Cross Island MRT line will be built under Singapore's largest nature reserve have started. Due to start last December, the investigation works, to determine the soil and rock profile under the Central Catchment Nature Reserve, began last month. 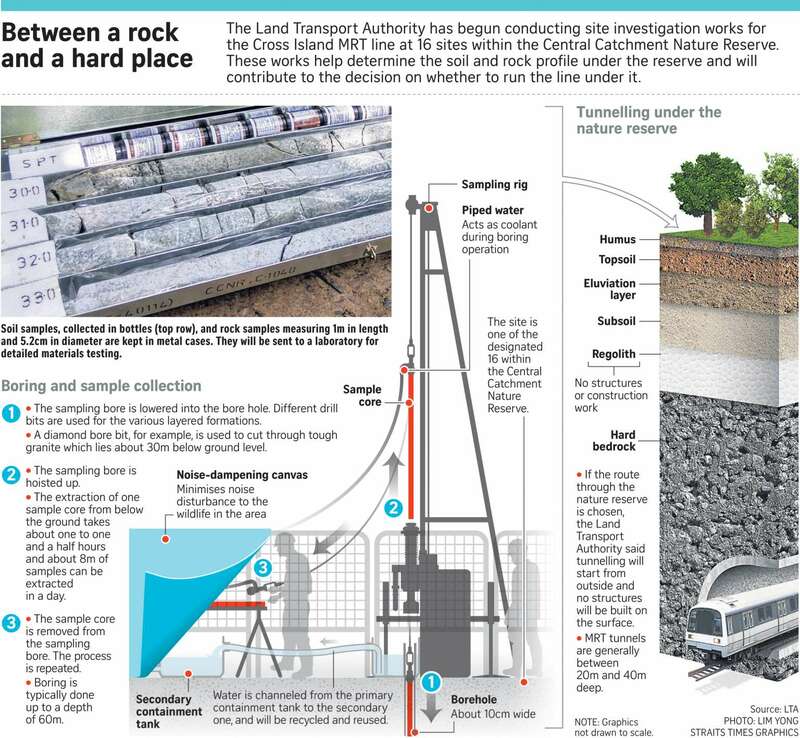 They were delayed because of "extensive discussions" between the Land Transport Authority (LTA) and National Parks Board on measures to reduce the environmental impact of the works, said LTA geotechnical and tunnels deputy director Goh Kok Hun. Some of the mitigation measures include keeping works to between 9am and 5pm, erecting noise barriers and keeping investigation works to public trails, to avoid disturbing wildlife in the area. The number of investigation sites has also been reduced from 72 to 16. "Workers have to observe the stringent requirements stipulated under the environmental management and monitoring plan for the works," said Dr Goh. Trial runs of borehole operations and geophysical surveys were also conducted off-site prior to actual works to familiarise workers with the requirements of working in the reserve, said an LTA spokesman. "These mitigating measures are the result of three years of engagement between the LTA and other stakeholders," said Nature Society president Shawn Lum. Expected to be ready in 2030, the 50km Cross Island Line will stretch from Changi to Jurong when completed. The authorities are considering two paths for the line - a 4km route, half of which would be under the nature reserve, and a "skirting alignment" that would take a 9km route around it. While the latter option is expected to tack on $2 billion to the cost of constructing the line, it could allow for an additional station to serve Thomson residents. It would also satisfy nature groups which have raised concerns about the possible environmental impact of running an MRT line under the reserve. Earlier this month, a tunnel boring machine digging in mixed ground conditions caused an old tomb at Mount Pleasant Chinese Cemetery to cave in during works on the Thomson-East Coast Line. Over-excavation had created a localised depression on the surface, said LTA. Such cave-ins are unlikely to occur should the authorities decide to run the line under the Central Catchment Nature Reserve, said Dr Goh. This is because tunnelling in the area would go much deeper and only through the granite of the Bukit Timah profile, not mixed ground conditions, he added. Soil investigation works are expected to be completed by the end of this year. Studies on the total impact of the project will be ready only by the end of next year, and a decision on the route of the MRT line will only be made after. Dr Lum, a senior lecturer at the Nanyang Technological University's Asian School of the Environment, is still hopeful that the new rail line will go around the reserve. "The skirting alignment would not just be beneficial for the environment, it would also allow for wider ridership for the MRT line," he said. Measures to mitigate the effects of investigation works for the Cross Island MRT Line (CRL) on wildlife have shown signs of working, the Land Transport Authority (LTA) said yesterday. It has found that wildlife is still present in parts of the Central Catchment Nature Reserve where drilling for soil samples has taken place. The drilling was part of the LTA's site investigations to study the impact of the CRL running under the reserve. The LTA found the presence of wildlife in monitoring results from cameras and ground surveys. Photos captured by camera traps included those of endangered animals such as the sunda pangolin and the lesser mousedeer. LTA's director of civil design and land, Dr Goh Kok Hun, said: "The findings were encouraging and validated the mitigation measures developed." These measures were put in place to minimise the impact of site investigation works on the flora and fauna in the reserve. The investigation works, which took place between May 2016 and September last year, involved drilling 16 boreholes to extract soil samples. 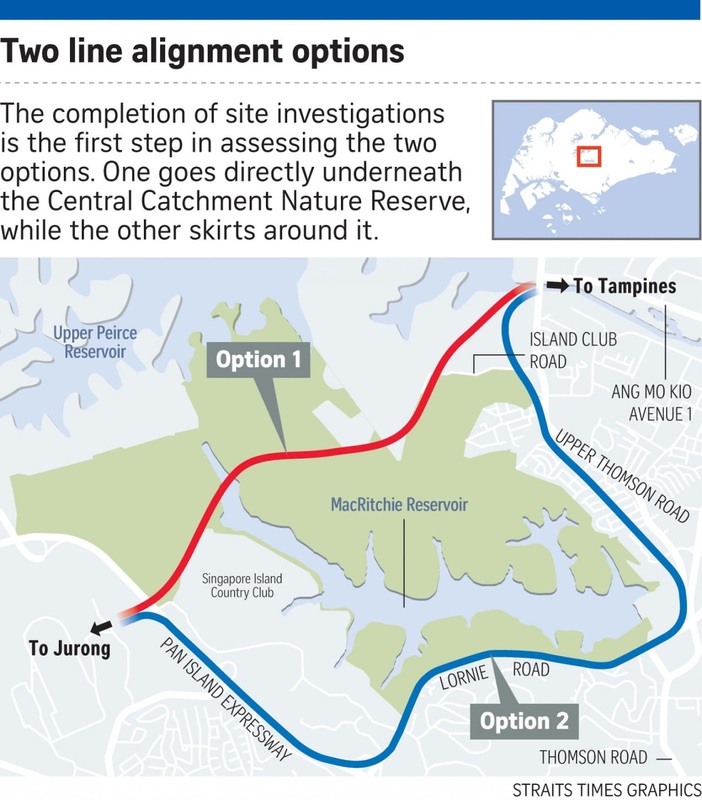 They were the first steps in assessing the two CRL alignment options - going directly underneath the nature reserve or skirting it, said LTA. The line, announced by the Government in 2013, had preliminary plans that showed it going under the reserve. This raised concerns among nature groups here. LTA consulted the National Parks Board and nature groups here over three years before drilling started. There was a comprehensive suite of mitigation measures, said LTA, such as reducing the number of boreholes required for the works from 72 to 16. Other measures included locating the boreholes on existing trails and clearings to minimise the impact on existing flora. National University of Singapore biology lecturer N. Sivasothi, who has been part of the discussions LTA has had with nature groups, commended the suite of measures.. He said discussions on the plan were so detailed that they included specifying how an engine pump was to be operated to prevent petrol spillage. These plans were necessary due to the potentially disruptive impact of the works, Mr Sivasothi said. He added: "The process of conducting the investigation could have led to pollution - soil and oil can make the waters murky. The running engine and workers in the area would also cause animals to avoid the sites." The boreholes were about 10cm in diameter and ranged from 50m to 80m deep at the different sites. Ms Chloe Tan, spokesman for the Love Our MacRitchie Forest volunteer group, said the presence of animals might not mean there was no impact on the animals. There is a need to know their abundance and distribution too, she added. She is hoping the line will not pass under the reserve. While Mr Sivasothi looks forward to the full results of the study on the site investigations, he said these might not be sufficient. "This is for the short term, but we will not know the long-term impact in 50 or 100 years, which is why we take great pains to avoid having works near or in the nature reserve," he said. Phase two of the study, which assesses the potential environmental impact of future construction - including tunnelling and operations - is ongoing and is expected to be completed later this year, said LTA. The CRL alignment will be finalised after the phase two results have been studied and discussed. The 50km Cross Island Line will stretch from Changi to Jurong, and is set to be completed in 2030.